Early this morning things seemed normal at the bluebird nestbox, but after lunch we saw mom bluebird coming out of the box and flying away in a different direction than she normally would. We looked in the box and found that there was only one egg left in the box. We did see a little bit of blood and were worried that one of the parents may have been hurt, but they both seemed fine. 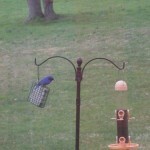 The remaining egg did not appear to be damaged so we were hopeful that we might still have one bluebird hatchling. 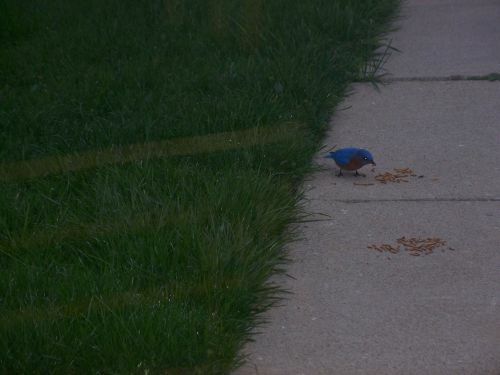 This evening our hopes were dashed when, after eating the mealworms, the male bluebird looked in the nestbox a few times, but the female did not go in and they both flew away. Five minutes later I saw a bird throw something out of the nestbox and then threw nesting material out. We went outside and a house wren flew out. We saw the bluebird egg on the ground under the nestbox. It had been pecked, so there was no chance of it surviving. In the past we have had a house wren in a box on the other side of the house, but this year a black-capped chickadee has laid five eggs (as of today) in it. Maybe the culprit house wren is the one that used to nest in that box. 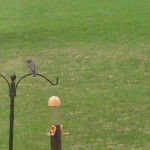 We will never know, but we aren’t too happy with the house wren. It is a very sad day, nature can be so cruel sometimes. 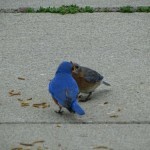 The male bluebird takes a piece of mealworm to mom. Judging by how wide her mouth is open she is expecting a big meal! 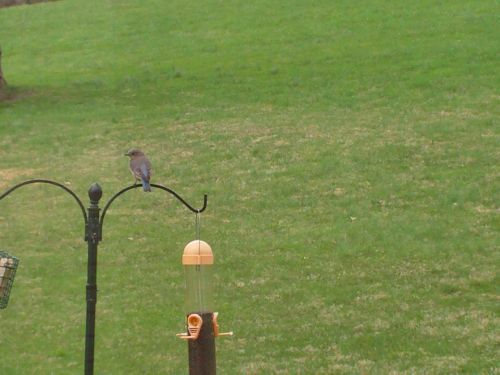 Mom bluebird continues to incubate the eggs in the nestbox which is a good thing since the temperatures have dropped into the 40’s and we even had a few snow flakes today. 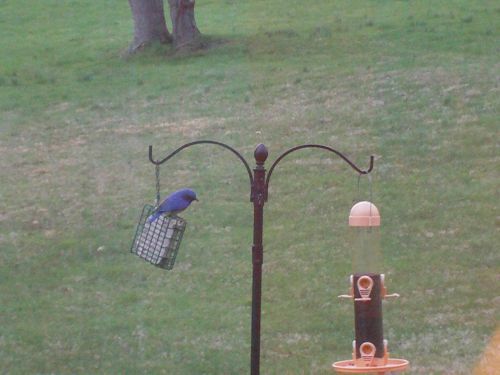 The bluebirds continue to stay very close to the nestbox and he chases away any birds that get too close. 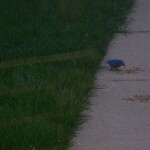 Looks like mom bluebird has completed her brood. There are five blue eggs in the box. She is spending more time in the nestbox and dad is usually nearby. Just a few minutes ago, while we were enjoying the beautiful day from the sunporch, dad flew to the ground, snagged a cricket and took it into the nestbox for mom. 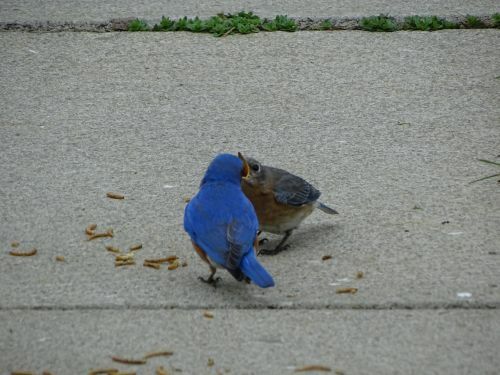 While we wait the 12 to 16 days for the bluebirds to hatch we will write about our experience with the bluebirds over the past five years.